Today NZXT launched the latest case in their Crafted series. For those of you that don’t know, the Crafted Series are the top of the line enthusiast cases that NZXT makes. Simply put, they rock. 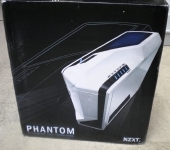 This is why we jumped at the chance for a first look at the NZXT Phantom. An impressive case can be the key component to the masterpiece on your desk, sometimes its too difficult to choose form or function, you have to have both. Join us as we inspect the flagship of this impressive line to see what they have in store. Editors Note: I have added personal commentary to the final page of this review as a result of recently using and installing a system in this case. I feel it is both applicable and important that anyone interested in the NZXT take a look. Skip to the last page to read my commentary. How is the white case lit up, is that a special edition, the black version doesn’t seem as bright. I think a feature like that should be highlighted.